[The EFF is]Â taking part inÂ Copyright Week, a series of actions and discussions supporting key principles that should guide copyright policy. Every day this week, various groups are taking on different elements of the law, and addressing what’s at stake, and what we need to do to make sure that copyright promotes creativity and innovation. All around the world, copyright policy is on the agenda. In the United States, lawmakers are nearly two years into aÂ process that promises to lead to the “Next Great Copyright Act.”Â In Europe, parliamentarians are re-examining some of the basic elements of the “Information Society Directive.” In Australia, the Law Review Commission and the Attorney General areÂ butting heads about which direction to take reform. And through all this, courts and companies are changing the way we think about our relationship to media and technology. Internet users need to be part of that discussion. 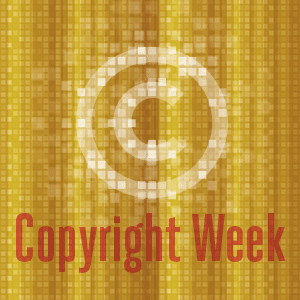 It’s Copyright Week: Let’s Take Copyright Back | Electronic Frontier Foundation.